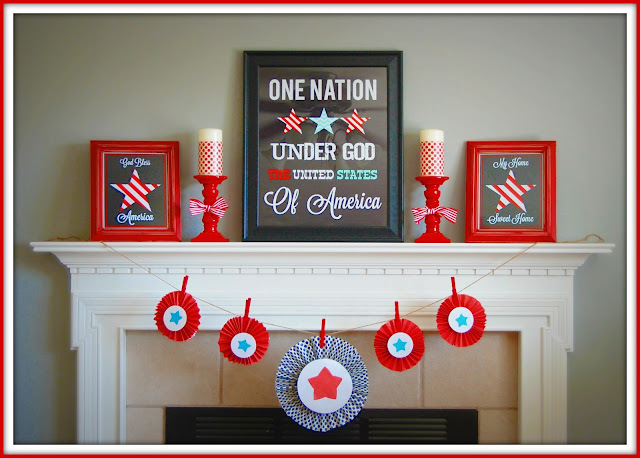 I am working on my Fourth of July mantle for 2014 and have been looking for inspiration all over the internet. There are some beautiful ideas out there and so I’m sharing a few of my favorites for today’s post in case you are looking for inspiration too. Kim at Star Shine Chic (great first name by the way) has a wonderful mantle in more muted colors. I’m a sucker for those tin stars, plus the way she turned the folding measuring stick into a star shape was so clever! Speaking of tin stars, Christina, at The Frugal Homemaker has them too and once again, they look great. 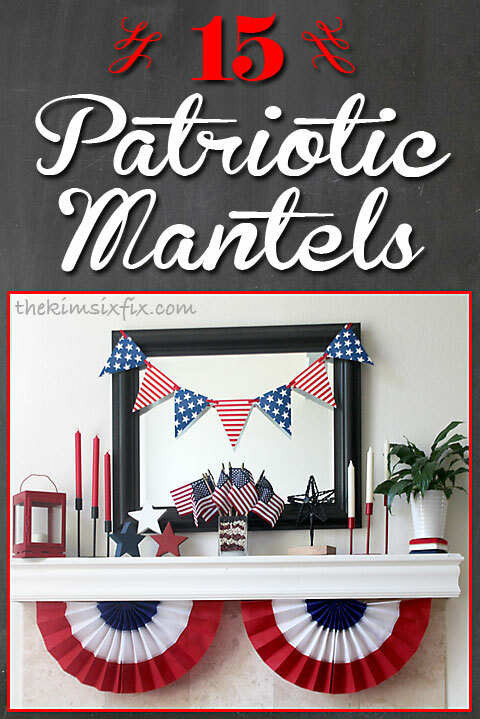 She actually has done multiple patriotic mantels and I don’t know which one I like more. The pinwheel banner on this mantel from Dandelions And Dust Bunnies is my favorite. I never would have thought to thread pinwheels onto a string. Landee sells printables, and this is a great example of what you can do with them. This one from Detailed Oriented Diva caught my eye because of the perfect symmetry. Blue Hydrangea Furniture has a beautiful set up this year. I love the blue shutters (I need to get some shutters..) and the way she made the little flag bunting out of jute webbing! 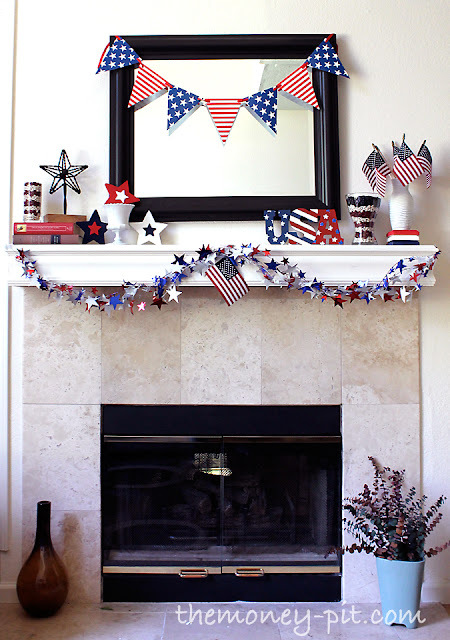 And finally, since today is Flashback Friday I am including my own past patriotic mantels. Last year’s was one of my favorites. I love the bunting most of all. I am not sure if I will reuse it this year, but when I look at it again, it sure is tempting. 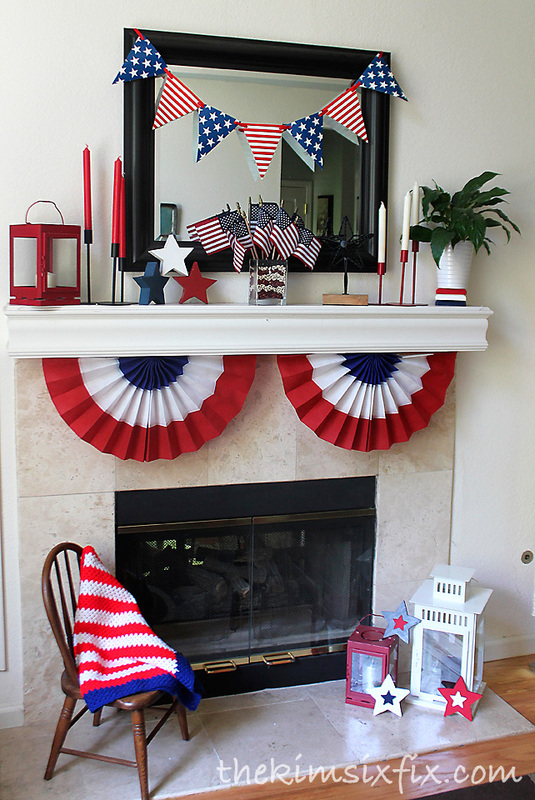 This year I already put up a vintage inspired red, white and blue mantel that would be perfect for Independence day. I recently removed Disqus comments and converted to the Facebook commenting system. I miss my big, white mantle after seeing this post! Now I have a rustic real fireplace with a teeny little mantle. These are awesome! I have the same (or nearly identical) mirror above my fireplace that you have. I like the way you have incorporated it. Though I also love your wood flag this year! I have a hard time doing mantels until fall because my fireplace is red brick,. But it will work with July 4th so I should just stop complaining and get something put together, LOL. Thanks so much for featuring my mantel! These are so lovely. I love the ones that have the old window panels and the window. It's so creative. 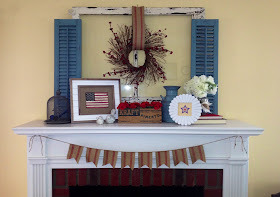 What a wonderful group of ideas for a July 4th mantel.. I love the banner of flags in your last picture... love the muted colours. Pinning this. Lots of wonderful ideas! I am loving all of them and now going to scroll back up to see which one I can try and find the time to make! Thank you for featuring my mantels in your awesome roundup! I love the 4th of July and all of these fun ideas! Thanks for your comments. I try to get back to anyone with a question.. so please make sure to leave an email address if you want a reply! This blog would be incomplete without my amazing Sponsors. Thank you so much for supporting The Kim Six Fix!